Hey everyone! Thanks for joining me today, for the April Papertrey Ink Senior DT challenge. This time around we bring you the Year of Flowers collection! There are a total of 12 sets and I've chosen to work with my favorite... the Sweet Pea. Here's what I came up with... 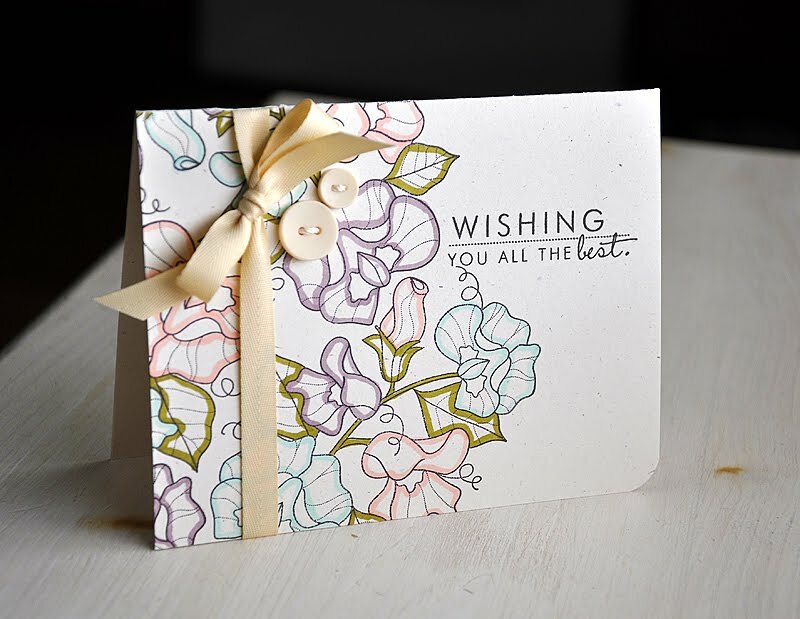 I started by stamping the sweet pea image a few times, in Smokey Shadow ink, onto a Rustic Cream card base. Then stamped the sentiment and rounded the bottom corner. For a pop of color, I traced the edges of each blossom and leaf with Copic markers (BG11, R20, V95 & YG95). To finish the card off, I wrapped the base with Fine Linen Twill Ribbon and embellished with a couple Fine Linen buttons. A Personal Update: For those of you who may be wondering... It's been a fast five weeks since my surgery and recovery is coming along very well. I am happy to report that the crutches have been gone for the past two weeks and the knee brace is now coming off. I've successfully completed three weeks of physical therapy and have three more to go. Thanks so much for all your thoughts and prayers. Love the outlining. Must steal that idea. And happy to hear that you're feeling better and getting stronger every day! Wow - this is gorgeous! Sweet Peas are my favorite flower - your work is lovely. Now, what about your card?? Phenomenal is what I say - love the simplicity of the image stamping and addition of colour tracing - so pretty! 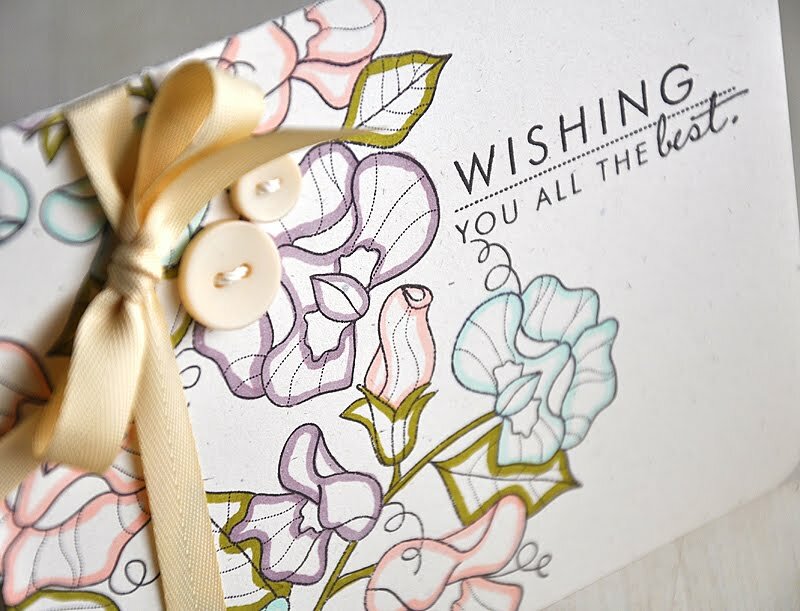 What a sweet and gorgeous card ~ think I can smell those sweet peas! You gals keep making me wish I owned some Copics but not sure I'm ready for that investment…yet. So happy to read that that your recovery is going well, Maile, and you're half way through therapy. Progress is always a good thing. WTG! I love the clean contemporary look of your card. The lighter colors are just enough to make the flowers pop! Well done! Oh this card is nothing short of AMAZING!!! Just beautiful, Maile. So are you going to be watching from the sidelines from now on or are you still in the game of Motocross?!! Such a beautiful card. i am glad to hear you are on the mend. Really this blog is looking very nice. And content is flowers news. This blog image really looking nice. sendfeelings is really very nice and good sites.